Browsing through a magazine I came across an advertisement for Rimowa Luggage and I had to investigate. Gazing at this luggage evoked memories of long-ago travel to exotic destinations. Junkers Ju52/3m. Photo by Flickr user Pat Dalton. Rimowa, a German company, was founded in 1898 by Paul Morszeck to provide travelers with wooden steamer trunks. In 1937 his son Richard, a former pilot, was inspired by the light-weight metal design of the German Junkers Ju 52 airplane. He was so inspired that he created luggage manufactured of the same aircraft grade aluminum to mimic the same grooved-look of the Junkers aircraft. RIMOWA Limbo blue_17. Photo by Flickr user Andytn. In the 1950s Rimowa introduced the ribbed/grooved exterior luggage, once again, inspired by the Ju 52. This grooved exterior has become Rimowa’s calling card. 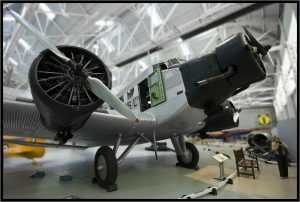 The National Air and Space Museum Library has many books on Junkers and the JU52 in English and in German. Hugo Junkers and his Aircraft (qTL686. 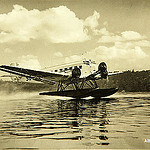 J8S35 E1988)by Günter Schmitt, Junkers; An Aircraft Album (TL686. J8T951 1971)by Paul St. John Turner, Junkers Ju 52 in Action (qTL686. J8F29) by Uwe Feist and Junkers Ju 52: Aircrafts & Legends (TL686. J8N94ju 1987) by Heinz J. Nowarra. 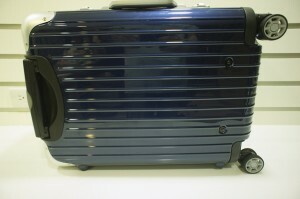 In September 2012 Rimowa is introduced a Classic Flight Collection. To coincide with this new line of luggage, the Ju 52, which was grounded in 1937, returned for its first transatlantic flight in 75 years in June 2012. The iconic plane is visiting 13 cities around the United States. So, the next time you are waiting in an airport, look around. See how many examples of groovey luggage you can find. I love the Rimowa line too. There is something almost aerodynamic about it! Unfortunately, that “utilitarianism” that you speak of in today’s luggage is a direct answer to three modern problems: theft, smuggling and airport baggage handling systems.